Here at Roll and Groove, I am always looking for ways to improve my gaming and recreational experiences. I am a sucker for painting miniatures, tweaking games with “deluxe” pieces, and building elaborate dungeons for any potential gaming experience. If you’ve read this site (which I know you have), you are familiar with The Soundtrack of Our Dice series of blog posts, where I create a themed playlist for some of the Gwarkonian’s favorite games. My desire to surround myself with music and games is what intrigued me about BattleBards when they reached out in early April regarding their Kickstarter offering. BattleBards is a premium audio suite for use with table top gaming, focused on the RPG community. Their offering not only includes a soundboard and mixer, but when the service goes live, will offer 500+ audio files available for use with the application. I have played RPG’s off and on for 30+ years (let that sink in) and Dungeons & Dragons still holds top spot in my all-time favorite games list. That said, I have gravitated heavily in the last few years to board games due to the high cost of entry, in terms of hours, that an RPG demands. My free time is limited and modern board games offer an impressive substitute experience that is compacted to 2-3 hours of commitment. Even though role-playing has been shelved for me as of late, I saw some potential with BattleBards being used to add depth and immersion in the board game world as well. Kyn Chaturvedi, their Development Producer and Community Manager, reached out and we exchanged several emails. After a lot of discussion and review, I was impressed with what they had to offer, but wasn’t completely sure it would translate well to board games. I agreed to pass it on to a friend who posted a great article about them (Kickstart that GEEK! BattleBards) on his blog, Melvin Smif’s Geekery. Then something happened interesting happened. Kyn emailed me to thank me for the connection to Kevin and mentioned a big announcement coming. They did something gutsy. They canceled their original Kickstarter, which was already two-thirds of the way funded with ample time left, went back to the drawing board, tweaked a few things, revamped the business model, and relaunched. Less than 12 hours later, the new Kickstarter was funded. The changes they made also rekindled my interest in how this could work for board games and I set out to chat them up. The team let me demo the original mixer for the Realmsound project, which is the precursor to the new BattleBards Soundboard and mixer. The mixer allows you to take audio files, drag them over to a mixer, then layer other audio samples on top of the first one. It doesn’t stop there. You can crop a sound clip to get just the piece you want, as well as loop audio tracks to keep a continuous effect going. From an RPG perspective, this would allow a Dungeon Master (or Game Master) to create scenes that can be played as the character’s trigger events. The board game community doesn’t have to sit back and watch all the fun, though. The audio tools could easily be used to make fantasy board gaming just as immersive an experience. The first game that came to mind for me was Lords of Waterdeep. How cool would it be if you could take the ambient sounds of a castle or city (check this sound file out, Castle Soundscape – Storm), then layer in merchants and other voice-overs and effects to create an audio backdrop for your gaming experience? The new audio tools will do all that too, but the team has even more to offer. I am still boggled in the head about how nifty that is. You can create your mix, export it to mp3, then drop it to your phone or tablet where it could be streamed via Bluetooth to a portable speaker or even to a wireless music manager like Sonos, which is what I use in my game room. Thinking about the Lords of Waterdeep example, I could create a 60 minute audio background of City and Castle ambient sounds, export it to an .mp3, then synch it up with my Sonos to play through my game room stereo. That’s cooler than a cavern in Icewind Dale, and they probably will have a sound for that too. This example, from the BattleBards website, shows some of the cool stuff you can do with the audio tools. Fantasy audio bliss. The team at BattleBards created this product with Table Top Role Playing Games in mind, but after demoing the Realmsound mixer and talking with the team about the enhancements to the new tools, I am convinced there is a ton of value to be had enhancing the board game experience. The Dungeons and Dragons Adventure Series of board games are no-brainers: Castle Ravenloft, Wrath of Ashardalon, The Legend of Drizzt, and most recently, The Temple of Elemental Evil. I’ve already mentioned Lords of Waterdeep, but what about creating scenes that play along with one of the scenario’s in Descent 2nd Edition? How amazing would it be create an extended battle scene for BattleLore 2nd Edition that started with an Orc War March (go ahead, click it. You won’t regret the decision)? In a time where Kickstarter, at least for the board game segment, seems to be not much more than pre-funding established publishers games, it’s refreshing to see an offering that is willing to actively listen to what its backers want, determine where the feedback is valid, and make changes based on that feedback. All of this sold me. I backed the Kickstarter campaign the morning after our discussion. I can’t wait to put together some effects and soundscapes for my favorite board games. I have also decided to jump back into the realm of RPG’s this Fall/Winter and plan on kicking off a D&D 5th Edition campaign for my family (and new recurring segment for this blog); My oldest daughter has been dying to try out the new system. When BattleBards releases the audio tools (estimated delivery in November 2015), I will easily get my money’s worth, being able to create an auditory accompaniment to my miniatures, dungeon pieces, and dice. 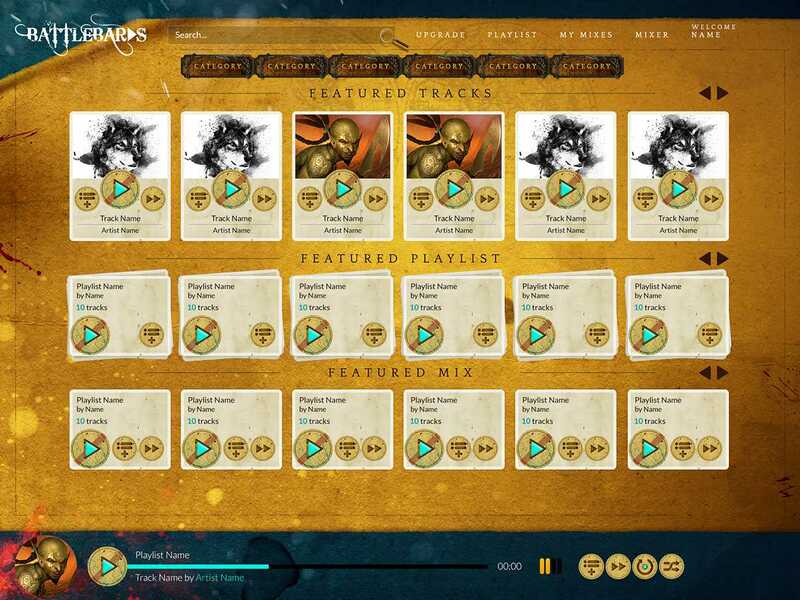 The BattleBards Epic Fantasy and Audio Tools are a win either way, RPG or board game. You can go down a rabbit hole of super detailed, staged events with sound effects and layering’s, but it can work equally well being that ambient background to your gaming experience. As of this writing, BattleBards is 194% funded with 13 days to go. It’s in your best interest to check out their Kickstarter page and get your pledge in. Roll well and groove on. Preferably to the sounds of a dragon razing your entire village.